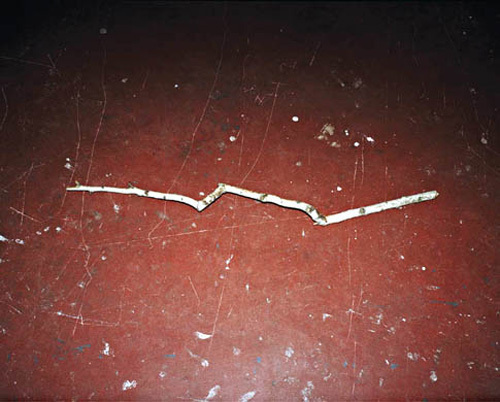 Philip Gaißer, Birke unlackiert (Unfinished Birch), 2008, color photograph, 28 x 36”. “Chiuso” (Closed)—the title of Philip Gaißer’s solo exhibition at the Palais für Aktuelle Kunst—alludes to the fact that Gaißer has closed all apertures, so to speak, and plunged the show into twilight. Indeed, it references the process of analog photography itself, which depends on a shutter closing in order to expose film to a particular amount of light. In the staging of his photographs, Gaißer takes twilight as his point of departure and develops a nuanced dramaturgy of illumination: The images are tempered by spotlights, light tables, isolated points of light, and the diffuse glow of daylight. That Gaißer here takes light, the essential medium of photography, as his theme is neither accident nor effect: In all of his work, the preconditions of the photographic image and the gaze of the apparatus are recurrent concerns. Gaißer understands the camera as a means for staging scenes, an instrument that, in showing, also alters reality and inserts interpretive contexts. Thus he has developed a language of images that infuses the form of the documentary with moments of artifice in which the picture only distantly corresponds to the subject it represents. It is often precisely the small details that cause irritation and provoke questions concerning the represented: Birke unlackiert (Unfinished Birch), 2008, doesn’t reveal much at first glance: a jagged birch branch on a red stone floor littered with scratches and spots of paint. The circular light illuminating the scene betrays that a camera’s flashbulb lit the branch from darkness: Gaze and image are momentarily congruent, as an object is literally isolated for a single instant. (Incidentally, the branch pictured evokes the stylized form of lightning.) Just for One Night, 2010, displays a queen of the night, a type of cactus that blooms in the darkness for only one night every year or several years. Throughout his works, Gaißer shines spotlights on many of his scenes, doubling the “gesture” of his camera’s flash, mingling image and presentation. In this sense “Chiuso” is not just a presentation of work but also a conceptual exhibition of the use of photography.